The Highlights: Fabulous ocean and bay views; a shady forest; idyllic picnic spots; "walking" sand dunes; a massive freshwater pond. Other Places Nearby: World-class beaches; a historic lighthouse; the resort areas of East Hampton and Montauk; unique shops; gourmet dining. Meetings & Event Options: A few local hotels and the Montauk Yacht Club have space for meetings, events and weddings. Texans and even New Yorkers may find it hard to believe, but cowboys once drove huge herds of cattle on the panoramic seaside land you walk through in Hither Hills State Park (see Getting Here and A Recommended Walk). This narrow strip of rolling hills, sandy woodlands, and coastal beaches wedged between the Atlantic Ocean and Napeague Bay was the home of the country’s first cattle ranch during the 17th Century. For the next 200 years, Long Islanders flocked to the eastern end of the island’s South Fork twice each year for the big event: watching the herd being driven to these grazing lands in May and then back in November or December. The end-of-the-year drive was particularly significant because Long Islanders didn’t celebrate Thanksgiving until the first Thursday after the herd was rounded up. Sometimes the weather remained warm late in the year, so the cattle were only rounded up in December. President George Washington declared in 1789 that Thanksgiving would be celebrated on the fourth Thursday of November, but Long Islanders ignored the edict until 1863, when President Abraham Lincoln implored them to join the fold. Poachers in the late 1700s were attracted to the valuable livestock and, disguised as fishermen, raided the grazing cattle. Their crimes became a national issue, prompting President Washington to build the Montauk Lighthouse so that agents manning it could watch for rustlers as well as guide boats. About 150 years later, in June 1942, other undesirables invaded. A German U-boat entered foggy Napeague Bay and dropped off four spies on the beach you stand on during this walking tour. The spies’ mission was to blow up bridges and rail lines, cutting off supplies to Long Island’s military-aircraft production plants. A Coast Guard officer spotted them digging trenches to conceal their military uniforms and supply of TNT. The spies tried to bribe the officer to keep quiet, hiked to the Amagansett train station and rode into New York City. The Coast Guard officer reported their arrival, and a manhunt ensued. Two of the Germans felt the heat and turned in their colleagues. They cut a deal with law enforcement officials, informing them that other spies had landed in Florida. FBI agents quickly apprehended the perpetrators. The two stool pigeons were sent back to Germany, and the others were executed. Long before the escapades of the white man — more than 4,000 years ago — Native Americans roamed these lands. Little is known about their history, because they had no written language. When Dutch explorer Adrian Block became the first white man to visit Montauk in the early 17th Century, the Meantauketts controlled the territory. Wyandanch, the tribe’s sachem, befriended another settler, Lion Gardiner, who bought a small island in Napeague Bay and became the first white man to buy land from the Native Americans on Long Island. Their friendship was genuine, and Gardiner’s family learned to speak the native tongue. A peaceful band, the Meantauketts hunted for food in East Hampton, on what is now Gardiner’s Island and throughout Long Island’s North Fork. They stalked deer and game and demonstrated their whaling expertise to the settlers. They were also skillful farmers, planting corn and beans. Tribe member Stephen Pharaoh, also know as Stephen Talkhouse, became a local legend, acquiring the nickname The Great Walker by supposedly walking from Montauk to Brooklyn — a distance of about 125 miles — in one day. The site of Talkhouse’s home is located in Hither Hills State Park. Unlike so many other tribes, the Meantauketts’ lifestyle was not ruined by the barrel of the white man’s gun. Rather, it was another tribe, the Rhode Island-based Narragansetts, who stirred up trouble. The Narragansetts approached the Meantauketts and another Long Island tribe, the Shinnecocks, and tried to recruit them in a war against the European settlers. Wyandanch informed Gardiner about the Narragansetts’ intentions, and the Meantauketts refused to join the plot. The Narragansetts tried to incite conflict by murdering a white woman in Southampton and a Meantaukett tribesman, and then by burning settlers’ homes. The Meantauketts paddled to Block Island to kill the Narragansett chief but fell victim to an ambush and suffered great losses. Montauk came under attack from the Narragansetts, who slaughtered numerous Meantauketts and kidnapped Wyandanch’s daughter on her wedding day. The daughter’s husband-to-be was killed. Lion Gardiner paid a ransom to free the daughter, and a thankful Wyandanch gave Gardiner a large parcel of land in what today is Smithtown. Today, Hither Hills State Park’s 1,755 acres straddle both sides of the two-lane Montauk Highway, the only access road to Montauk Point, the eastern tip of Long Island’s South Fork. Gorgeous Atlantic Ocean beaches rim the park’s southern edge, while the majestic beaches of Napeague Bay stretch along the park’s northern border. As you look to the east up the shoreline of Napeague Bay, tall sandy cliffs topped by green shrubs and trees tower above the beach. Between the bay and the ocean stands a dense forest filled with oak, pine, and Russian olive trees. Freshwater ponds such as Fresh Pond, which is so massive it could be mistaken for a lake, dot the land. But the one geographic feature that really makes this land unique is the area of “walking dunes” to the west, sandwiched between Fresh Pond and Napeague Harbor. The parabolic walking dunes are covered with trees and shrubs, and some migrate in a southeasterly direction. 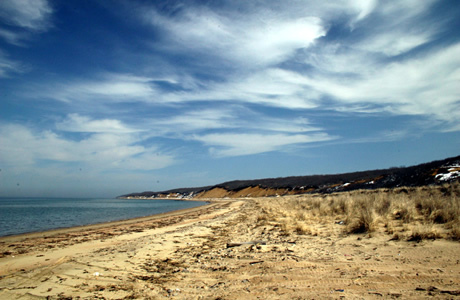 Though wind currents constantly change their size and location, some dunes are 50 feet high, the tallest on Long Island.